Moi, kaikille (Hi, everyone). It’s been a while, hey? Sometimes life gets in the way. Earlier this year, my mum passed away suddenly back home in Australia and we spent a stressful, heartbreaking three weeks there dealing with the aftermath of that. I miss her every day, and some days are easier to deal with than others. I’ve actually had this post sitting in my drafts for a little while, waiting on photos. When Luke took the photos, I was feeling good – I felt like I looked good, it was the first time it had been cold enough to wear this dress and I was comfy and cosy. I wore it on a trip to Pori and Rauma with my dad and his wife on their recent visit to Turku, and Dad complimented it. I wore it to work after they left, and one of my friends asked where I bought it, and said it looked like something you could buy in a shop. I know some people think that’s not the greatest compliment, but I like it as it means it doesn’t look “home-made”. So, I was feeling pretty good about this make. That was, until I sat down to look at the photos. Instead of looking cute and stylish, I just look chubby. I’ve put on some weight this past year due to a medication and not being as careful with my diet, and it’s bothering me. But let’s step away from the pity party and talk about the details, because photos aside, I love this dress! 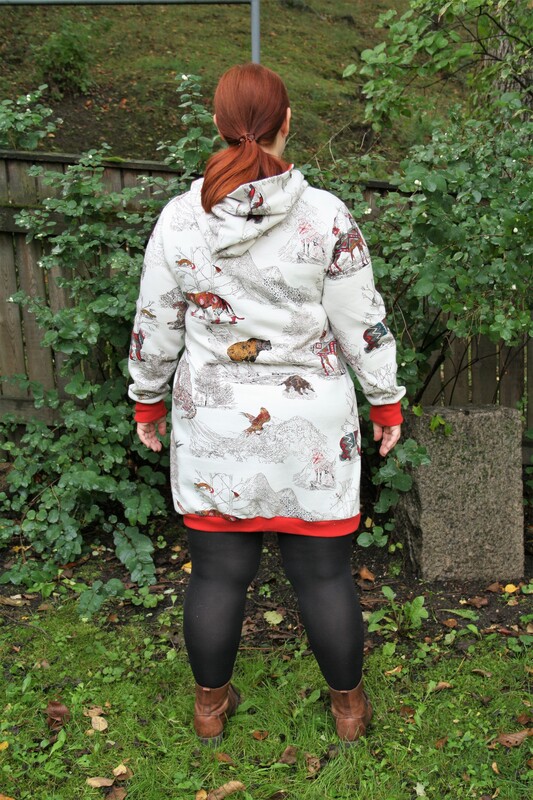 This was my first time sewing with an Ottobre pattern, and I was inspired by Katharina’s version. She was kind enough to buy me my own copy of the Ottobre issue (2/2017) containing the pattern, and mail it to me in Finland! Aren’t sewing friends lovely? 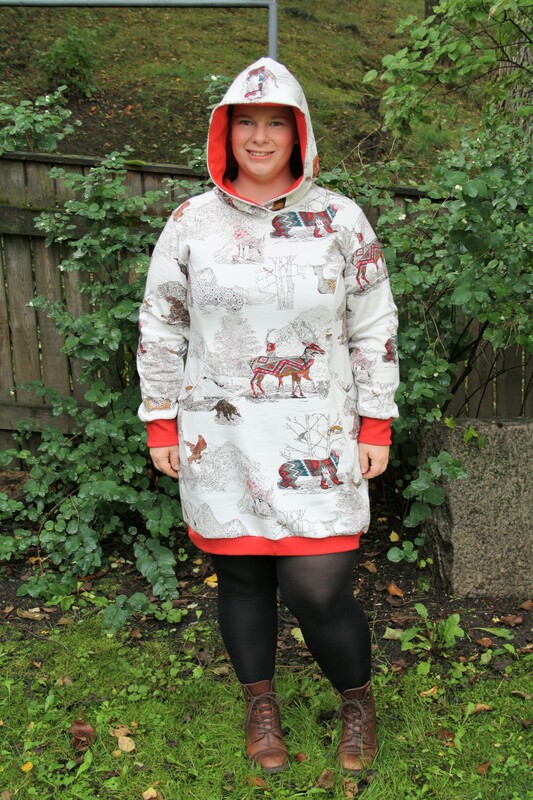 ❤ For those that aren’t familiar, Ottobre is a Finnish pattern magazine released four times a year, usually two kids and two women (however they recently did a family version with some men’s patterns!) It’s the usual European deal – horrendous tracing and adding seam allowances, but the patterns are quite cool in my opinion and worth the effort. 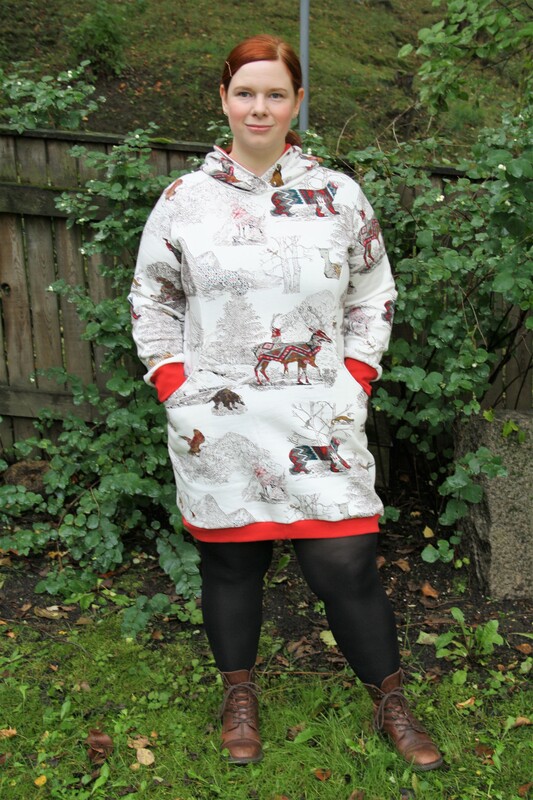 I already knew what fabric I would use – I’d been hoarding this sweatshirt knit from Spotlight in my stash for a couple of years, waiting for the perfect pattern, and this was it. I decided to add contrast red rib knit hem and cuffs, and line the hood in a red jersey, both bought locally from Kangaskapina. I made size 44, with a small 4 cm full bicep adjustment using my preferred method that I always use now from Professor Pincushion.. I can see here that I should have done a swayback adjustment, though (and pressed the bottom hem better, eep). I left the length as it was – I think it’s supposed to be a tunic, but I’m just wearing it with tights in these photos. 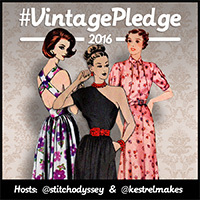 I plan to wear it with fleece leggings as the weather gets colder. I had a little bit of trouble with the construction of the pockets – my version of the pattern was in German, and although I speak a little German and Google Translate generally does an okay job of German to English, I couldn’t get my head around how they went together. I emailed Katharina in the end, and she explained it to me beautifully and I was able to get them right first try. The pattern doesn’t have the hood lined, but I just used the same pattern piece as the lining and added extra seam allowance to allow for sewing them outer and the lining together. 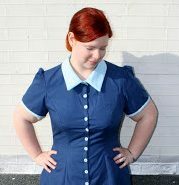 I sewed the whole thing on my overlocker, except the pockets as I thought that would be courting disaster. I’ve worn it about five times in the last two weeks, and it’s so comfortable. The pockets are big enough for my wallet and phone, and the hood is nice and roomy. The fabric feels like nice quality – it’s quite thick and is soft and fluffy on the wrong side. However, I noticed it’s pilling a little on one hip from when I wore my leather satchel with it, so that’s a bummer. 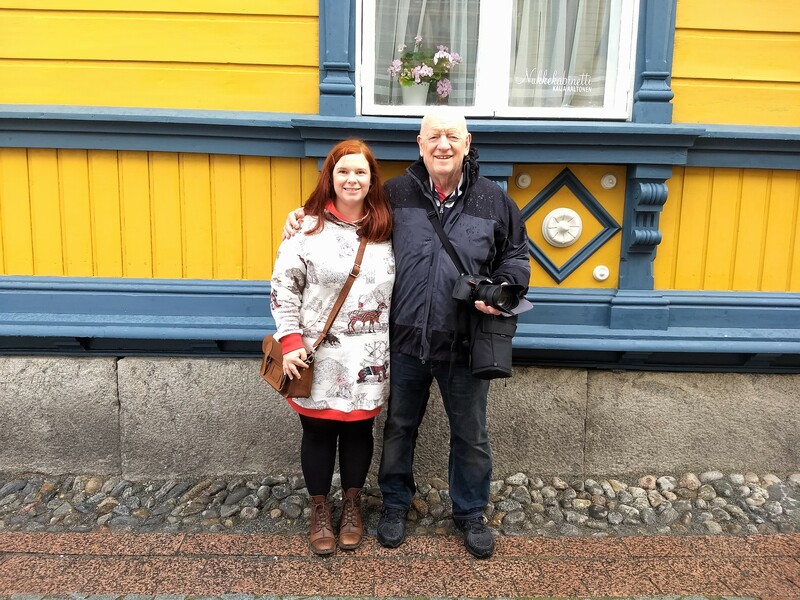 Here’s my dad and I outside one of the colourful old wooden buildings of Rauma. I’ve already bought more fabric to make two more of these dresses, as I think they’re going to be an autumn/early winter staple for me! Ohh how did I not find that when I was desperately searching? Thank you so much, I will bookmark it for next time because I know I will get confused again. I’m sad to hear about your Mum. I hope you’re doing okay. Thank you 🙂 I’m doing okay now.